The American Architectural Manufacturers Association (AAMA) celebrated 15 consecutive years of furthering the careers and education of students pursuing a degree related to the building products industry by awarding seven AAMA scholarships to children of employees of AAMA member companies. 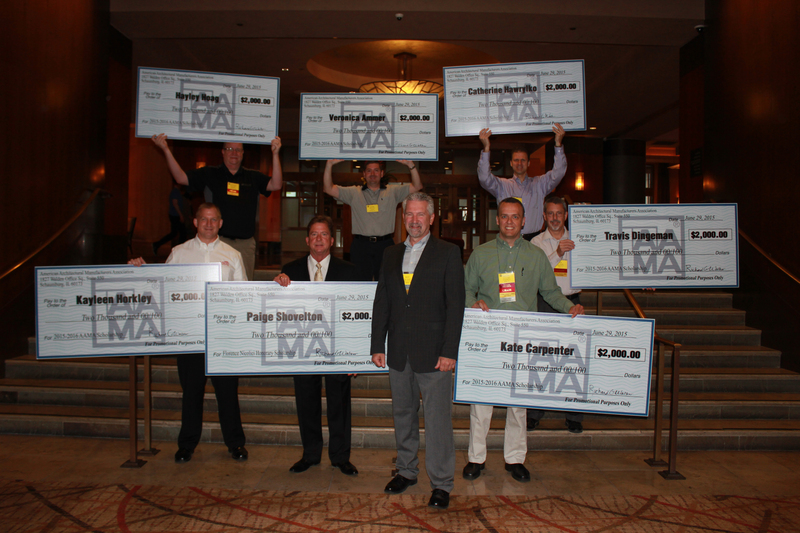 The scholarship award winners were announced during the 2015 AAMA Summer Conference, held June 28-July 1, in Seattle. The recipients of nine partner scholarships also were announced. The AAMA scholarship is a one-time award of $2,000. All children of employees of AAMA member companies are eligible to obtain this financial aid for higher education in pursuit of a degree in an engineering or technical field relating to the building products industry. Applicants are judged on grade point average, college entrance exam scores and a 500-word essay. Eligible candidates must be high school seniors or college students who are children of employees of AAMA member companies in good standing. Company representatives from left to right (back): Steven Saffell (Simonton), Mark Ammer (Chelsea Building Products) and Mike Balasko (PolyOne); (front): Darold Horkley (Milgard), Brent Slaton (Keymark), Ray Garries (MI Windows & Doors), Kevin Gaul (Pella) and Joe Hayden (Pella). The 2015 Florence Nicolici Honorary Scholarship Award was awarded to Paige Shovelton, a soon-to-be freshman at Rensselaer Polytechnic Institute. She will be pursuing a degree in engineering, and she is interested in math and science. Her father, Robert Shovelton, is an employee of Keymark Corporation, in Fonda, New York. The first 2015 AAMA Scholarship Award recipient is Kate Carpenter, who will be a freshman at Purdue University this fall. She is pursuing a degree in biomedical engineering and ranked number one in her class. Her father, Chris Carpenter, works for Pella Corporation in Chicago. The second recipient is Travis Dingeman, who is a soon-to-be freshman pursuing a degree in mechanical engineering this fall at Iowa State University. In his essay, Dingeman said he hopes to use his degree someday to help improve the world we live in. His mother, Jean Dingeman, works for Pella Corporation in Pella, Iowa. The third recipient is Catherine Hawrylko, a soon-to-be freshman at Ohio State University (OSU). Hawrylko plans to major in mechanical engineering and is enrolled in the Honors Engineering Program at OSU. Her father, Roman Hawrylko, works for PolyOne Corporation in Chicago. The fourth recipient is Veronica Ammer, who will be a freshman this fall at the University of Arizona, where she will pursue a degree in chemical engineering. She would like to use her degree to improve environmentally friendly products in the building industry. Her father, Mark Ammer, works for Chelsea Building Products in Oakmont, Pennsylvania. The fifth recipient is Kayleen Horkley, who will start this fall at Brigham Young University-Idaho. She plans to pursue a degree in architectural engineering and enjoys the process of designing buildings. Her father, David Horkley, works for MI Windows and Doors in Fife, Washington. The sixth, and final, recipient is Hayley Hoag, who will start her freshman year at Stephen F. Austin State University in the fall. She will pursue a degree in engineering, and would like to use it to help advance society. Her father, Christopher Hoag, works for Simonton Windows in Columbus, Ohio. For more information, visit the AAMA Scholarship Program web page or contact Jannine Klemencic, AAMA’s executive department assistant. Videos of the AAMA Scholarship Award winners accepting their awards can be found on AAMA's YouTube Channel, along with those of past winners.